I saw this demo of a new musical instrument/toy in Vic, Spain. 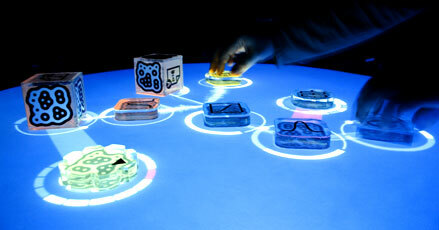 Called Reactable, it employs physical blocks which are moved by hand(s) on a sensing table. Each different block triggers a different musical or sound event. Spacial distance and orientation counts in the compostion. Invented by some Barcelona geeks, it’s been making the rounds in Europe. The display is intensely visceral. You see the music as well as hear it, as well as feel it in the blocks as you move them. You can get a sense of its potential from this YouTube tutorial video. I saw the Reactable played in a small bar near Vic university (video of the event is shown below). It was mesmerizing to watch, even more fun to play.You intuitively know what to do. No manual required. Apparently Bjork saw this YouTube demo and had one built for her own use. During one of Bjorks’ performences a dj plays the Reactable about halfway through the video. This visual instrument reminds me slightly of elegent Nintendo GameBoy music toy, Electroplankton. Here you need to use a stylus to move the musical agents, but you achieve a similar result: you can see the spatial dimensions of the musical arrangement. There is a least one group taking the Electroplankton platform seriously. 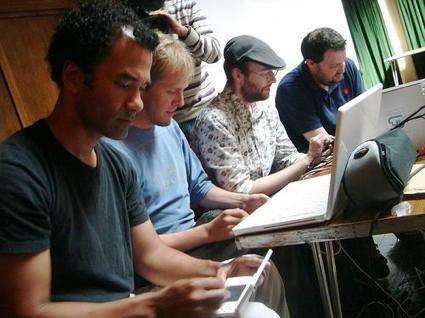 The Electro Plankton Quartet play four Nintendos. They have a MySpace page where you can hear some samples.